Gain the tools to help you set up an electrical safety program that saves lives. 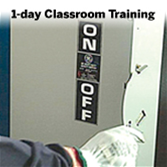 Invest in one day of essential training with NFPA®'s new Developing an Electrical Safety Program Based on NFPA 70E*. Having an electrical safety program in place is critical to ensure the safety of personnel in your facility or facilities. Electrical dangers in the workplace cause hundreds of deaths and thousands of injuries each year, and electrical incidents are usually more costly and serious than other types of workplace incidents. NFPA 70E®, Standard for Electrical Safety in the Workplace® -- the standard originally developed at OSHA's request -- is the key to saving lives, reducing liability, and avoiding loss due to electrical incidents. This new one-day classroom training from NFPA gives facilities managers, building owners, and others responsible for workplace safety a basic understanding of NFPA 70E's purpose and how to apply it for compliance with OSHA 1910 Subpart S and OSHA 1926 Subpart K.
Taught by NFPA 70E experts with a background in facility management, this training helps you outline the roles, responsibilities, and standard operating procedures for electrical safety in each facility. You'll go back to work with a wealth of templates and checklists you can use to help you create an electrical safety program. You'll also be prepared to conduct annual or periodic reviews to validate code requirements and update or modify to existing plans when needed. An NFPA 70E pre-class quiz. Take this quiz to test your knowledge and if your score is not what you'd like it to be, you can take NFPA's 6-hour online training series. Pre-class webinar. Introduction to NFPA 70E. Available on demand. These educational tasks are highly recommended before attending this class. In this video NFPA's electrical Tech Lead, Derek Vigstol, talks about the class, what you will learn, who should attend and the practical application of the knowledge you can apply at your organization. NFPA 70E, Standard for Electrical Safety in the Workplace Handbook, 2018 Edition, and access to the 2018 NFPA 70E Online Training Series. Complete this course and qualify for 7 hours or .7 CEUs for this 1-day classroom training. Attendance is required to earn CEUs. Please verify applicability with your professional board or organization before attending. Ask for the National Fire Protection Association (NFPA) Rate at either of these 4 local hotels: 1. Beantown Inn; 2. Candlewood Suites Boston; 3. Residence Inn Marriott Boston/Braintree; or 4. Embassy Suites Boston at Logan Airport. For more information, click here.